When it comes to goal setting, many people attempt to take on a perfectionist attitude, thinking it will lead to success. However, from own personal experience as well as through the work with my clients I’ve seen that the opposite often rings true. 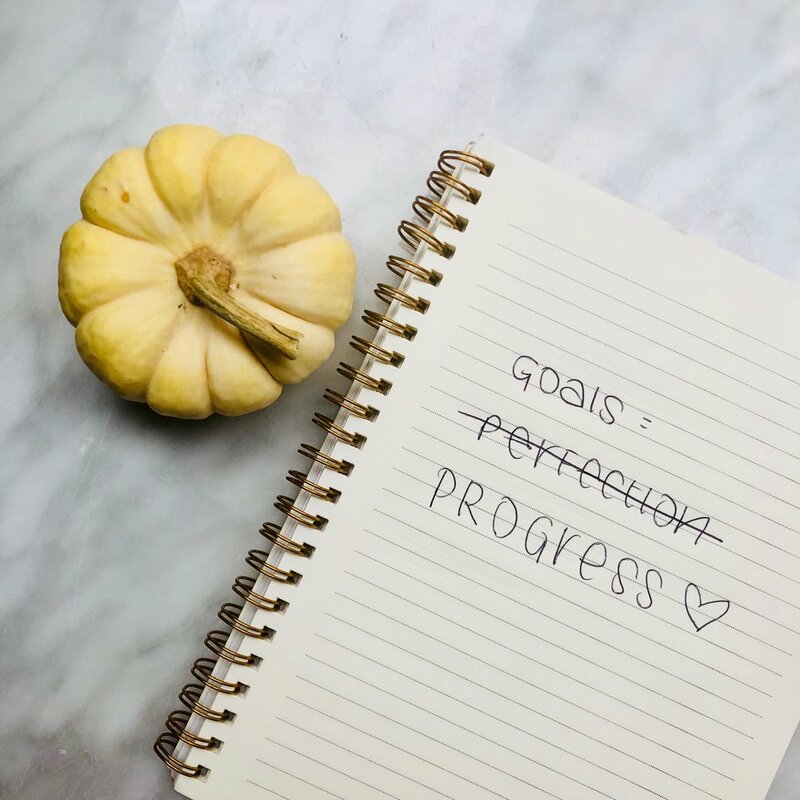 Before goal setting with clients the first thing I make sure we go over is that our goals are realistic and perfectionism and realism generally do not go hand in hand. 1. Perfectionism can leads to unrealistic goal setting and often gets in the way of achieving your goals entirely since it leads to “all or nothing” thinking – aka sadly for many people…motivation is high in the beginning, but once you’ve veered off your desired path you’re more likely to throw in the towel and give up. Instead, dont be afraid to allow yourself to be “imperfect” and make mistakes – this is where the real growth happens! 2. Focusing on progress can make it not only easier to achieve your goals, but more enjoyable since it embraces a mindset of learning instead of failure. You know yourself best and therefore can also be your own best teacher. 3. Focusing on progress gives you an excuse to always celebrate something (I’m all about enjoying those small wins! ), which motivates you to keep going in order to achieve your goal in the long run. 4. Lastly, its more sustainable…by prioritizing progress, you can more easily overcome obstacles and ditch “all or nothing” thinking, since you know that you don’t have to be perfect and instead can embrace ups and downs as normal learning opportunities during a period of growth. Understanding that the path to success is rarely a straight line will make it easier to succeed in time. Interested in learning more about working with me for 1:1 nutrition and health coaching using a progress, not perfection mindset? Sign up for your free 15-minute phone consultation here!